please download the track as an MP3. With many years of experience telling and listening to stories, a growing collection of published audiobooks, as well as countless hours of reading to my own and other people�s children, I know what it takes to tell a good story. I am a regular narrator for the prestigious audiobook production company, Bee Audio, and have completed Bee's rigorous Home Studio Certification Course. You can find me on their UK Narrators roster. I also do work for White House Sound and Podium Publishing, and am a registered narrator on ACX. 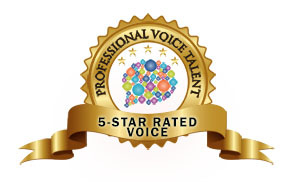 No one voice is ever going to be suitable for every book ever written, but have a look at what other people have said about my voice and my work, have a listen to a few of my audiobook sample tracks, and see whether my voice would be suitable for your book. You can also have a look at the audiobooks I've currently got published on Audible. If you like what you hear, get in touch! Whether you want me to record in my own studio or to come to yours, I�m happy to do whatever I can to get your audiobook sounding the way you want it. ~ Frances Hardinge, Author of The Lie Tree, Costa Book of the Year, 2015. ~ Charlie Paull, Audible reviewer. ~ Guy Spier, in an Audible review of his own book. ~ Mr Acapella, Cornwall, UK, Audible reviewer. © Copyright 2013, Malk Williams.